Namazu | Leah Palmer Preiss ~ Curious Art: Acrylic on paper, ~6.75" x 4"
Namazu Acrylic on paper, ~6.75" x 4"
I painted this last year as part of the AlphaBeasts! series. This week’s critter for AlphaBeasts! is Namazu, a giant catfish monster who causes earthquakes & tsunamis whenever he manages to wrestle free from his usual captive state. 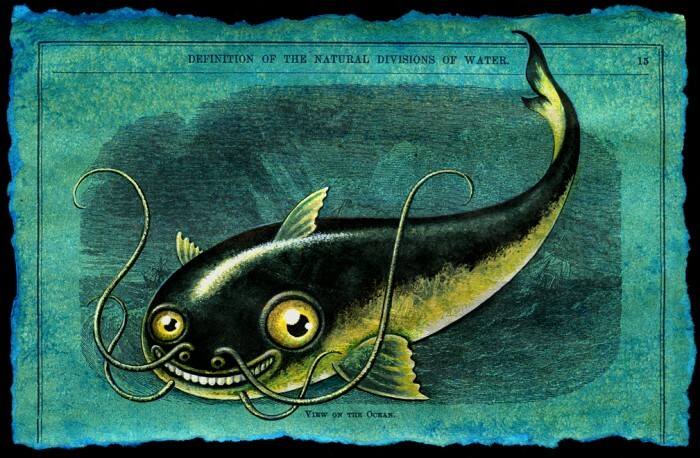 I thought it was interesting that catfish do tend to abandon their normal bottom-feeding habits when they feel tremors; their unusual activity at such times probably led to this legend. This entry was posted in Paintings and tagged Acrylic, Catfish, Illustration Friday, Namazu, Paper, Underwater, Yokai on 9October 2013 by Leah. What a stunning beauty! The light makes him shiny and splendid! Thank you so much, Hedwig! Fish are beautiful creatures, even the humble catfish.